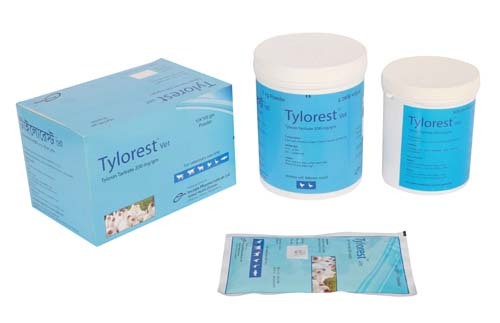 Tylorest: Each gram powder contains Tylosin Tartrate BP 200 mg.
Tylosin Tartrate is a macrolide antibiotic that is very effective against both gram and gram negative bacteria. It inhibits protein synthesis through attached with 50S ribosomal subunit. Tylosine Tartrate has numerous benfits like first choice to treat mycoplasmosis, enhance cell mediated immunity, can be used in the feed or drinking water, good penetration capacity, quick absorption by oral intake, wide antibacterial spectrum & absorption rate is higher than that of erythromycin. Tylosine Tartrate is effective against gram positive like Staphylococcus aureus, Streptococcus, Diplococcus, Corynebacterium, Erycepolothrix, Clostridium and gram negative bacteria like Proteus, Salmonella, Shigella, Klebsiella, Mycobacterium and disease conditions like sinusitis, enteritis and pneumonia. Tylosine Tartrate has a particular action against Mycoplasma gallisepticum S6, which is implicated in the CRD complex in chicken & infectious sinusitis in turkeys. The use of Tylosin Tartrate as feed additive to promote growth is safe. Tylosin Tartrate has no side effect at recommended dose. However, diarrhea and articaria may be reported. While handling and mixing the drug, protective clothing and impervious gloves should be used.